New! Japanese kitchen knives by Hiroshi Kato now available at our store. Hiroshi Kato is one the most respected blacksmiths in Japan. In 1935 Hiroshi Kato- father became independent from his Sensei. After finishing high school Hiroshi Kato began his apprenticeship under his father. It’s amazing that after over 50 years as a knife maker he’s still inspired by thinking of people cooking with his knives. He always considers balance when hammer the steel, keeping in mind where a knife needs to be thin and where it needs to be strong. Kato-san runs a very professional workshop and has even taken on great apprentices like Yu Kurosaki and Toru Tamura. Kato-San works at Takefu Knife Village co-operative. It’s amazing that after over 50 years as a knife maker he’s still inspired by thinking of people cooking with his knives. 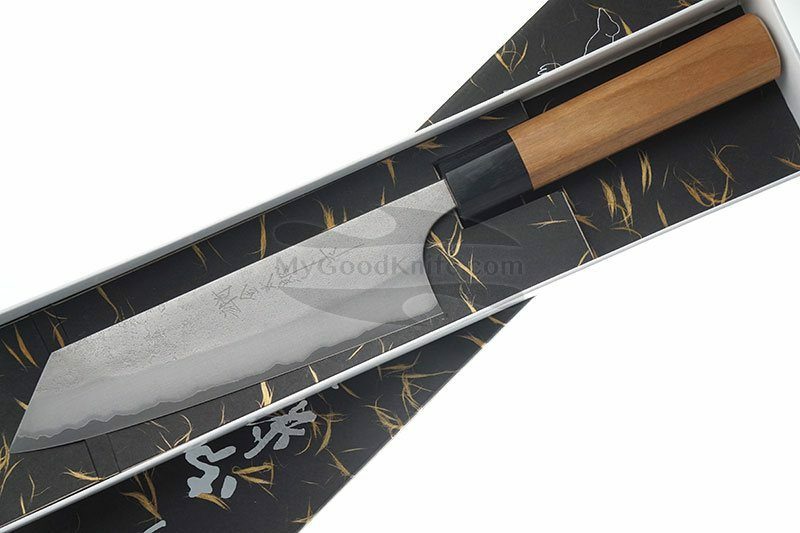 In our store you can buy 4 models of Hiroshi Kato knives: bunka, santoku and chef knives 18 and 21 cm. Blades of Hiroshi Kato’s knives are made of Aogami steel, cherywood handles. Black Packer Wood bolster. Hiroshi Kato kitchen knives are packed in brand boxes.